The first day of winter is upon us, in ancient times this day was celebrated as the festival of Samhain ( 1st November). The eve of this day was also of great importance and was known as Oíche Shamhna ( night of Samhain) or Hallowe’en. The name Hallowe’en derives from the fact this is the evening before the Feast of All Saints (The Hallowed Ones). Where I’m from everyone pronounces the ‘a’ in Halloween. I asked my parents about this and they told me this was how they and my grandparents had always pronounced the word. Ive been doing a lot of driving recently and I have noticed that everyone on the radio pronounces the ‘a’ as a ‘o’ saying Holloween. I wonder is this a new development? When I was a child Halloween was pretty low key in our house but great fun. We usually celebrated the event with our cousins who lived near by and we would play bobbing for apples, where a large basin of water was placed on the table and we each took turns fishing the apples out of the basin. This was no easy feat as you had to use your our teeth, keep your hands behind your back. We would eat lots of sweets and tell ghost stories. I don’t remember dressing up in costume but we always had a plastic masks that we bought at the pound shop or made from a cereal box. There was always barm brack a type of light fruit cake which I hated but would pretend to eat in the hope of getting the slice of cake with the coin inside. Traditionally, a ring and a coin were baked into the cake. If you got the coin would be rich and if you got the ring you would get married. I visited the National Museum of County Life at Turlough Park Co Mayo this summer. The museum has a really interesting exhibition on the old Halloween traditions celebrated in Ireland. 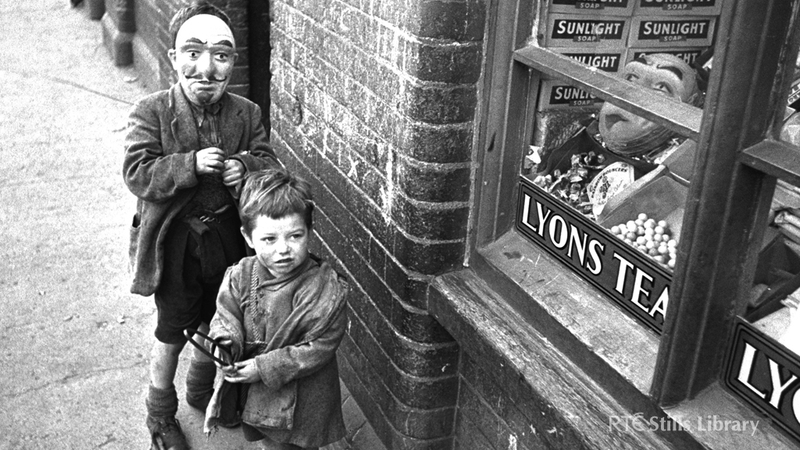 The wearing of masks is an old Halloween tradition in Ireland and the exhibition includes a number of Irish traditional Halloween Masks called Fiddle Faces. There was a long standing tradition of gangs of masked boys going to each farm house in the district in order to receive food or money, doing mischief if they were not well received. It not surprising then that special crosses were made and placed above the door to protect the home from bad luck for the coming year. This Halloween Cross is from Barr Thráú, Iorrais, Mayo and is on display at the National Museum of Ireland-Country Life. Another very old tradition was the carving of turnips into a figure known a Jack O Lantern. In my opinion the turnips are terrifying when compared to the pumpkin. Irish immigrants took the tradition of Jack O’Lantern to America where pumpkins were substituted for turnips. The Jack O Lantern below was traditionally carved in (Fintown) Baile na Finne, County Donegal Gaelltacht, c. 1903 . Jack O Lantern below was traditionally carved in (Fintown) Baile na Finne, County Donegal Gaelltacht, c. 1903 National Museum of Ireland . In recent years in Ireland the turnip has been slowly replaced by the pumpkin which is now widely available in supermarket. There is a perception that the turnip is difficult to carve and the pumpkin is less work. There are however benefits to making the effort and carving a turnip for Halloween, turnips last longer then pumpkins when carved. In my opinion they have a lot more character then the pumpkin. You get more for your money, three turnips are the price of one pumpkin. You can also turn the turnip leftovers into dinner. My tip for anyone who wants to try carving a turnip is to use a melon baller to scope out the inside. If you can I highly recommend a visit to the permanent Halloween exhibition at the Museum of Country Life. For anyone who would like to find out more about Ireland Halloween traditions there is wonderful account provided by Irish Archaeology.ie also see the links below. Duchas.ie also has lovely presentation available as a pdf of old Halloween traditions in Ireland. The tweet below also has links to the RTE Halloween Archives. Danaher, K. 1972. The Year in Ireland. irish Calender Customs. Mercier Press.